Introducing the Ultimate Portable Car Lift System! The QuickJack portable lifting system makes vehicle maintenance on the track and off convenient and lightning fast. The QuickJack can go anywhere and can be easily stowed in the trunk or back seat of most cars when not in use. Bring it to the track or drop it on your garage floor to perform routine maintenance in the comfort of your home, all in seconds. QuickJack is the amazing portable cart lift that represents the best in American aftermarket ingenuity. The QuickJack is sweeping the globe, and we’re thrilled to join the future of auto tech in Germany. 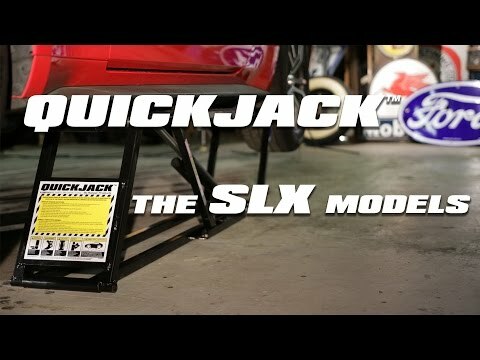 Enthusiasts, DIY’ers, racers and shop professionals, as well as anyone who has ever worked under a vehicle using car jacks and jack stands, will enjoy the finely tuned craftsmanship and effortless electric-hydraulic lift of the QuickJack. It’s never been easier or more fun to work on cars: after the simple touch of a button, it takes less than 30 seconds for the QuickJack frames to fully lift 21” high and automatically lock into place. No crossbars exists anywhere on this product, so there’s nothing to block undercarriage access or get in the way of your work. When you’re done, the frames collapse to a low 3” profile for fast and easy storage. Feel free to throw away your jack stands, because you’ll never use them again once you switch to the QuickJack portable car lift system!